IBM has recently released details of a neuromorphic chip named TrueNorth via their website, the press, and a research report in the journal Science. The research team, headed by Dharmendra Modha as part of the DARPA SyNAPSE Program, developed a chip containing a million "programmable spiking neurons" and 256 million synapses. The chips use 5.4 billion transistors on 4096 "neurosynaptic cores" which each has its memory (in the form of connection routing and timing delays) close to its "neuronal" processing units. 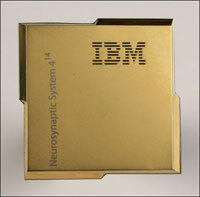 IBM has recently released details of a neuromorphic chip named TrueNorth via their website, the press, and a research report in the journal Science. The research team, headed by Dharmendra Modha as part of the DARPA SyNAPSE Program, developed a chip containing a million “programmable spiking neurons” and 256 million synapses. The chips use 5.4 billion transistors on 4096 “neurosynaptic cores” which each has its memory (in the form of connection routing and timing delays) close to its “neuronal” processing units. This architecture, including plasticity rules, enables pattern learning and recognition in a manner broadly similar to brains and far superior to current von Neumann architectured computers given tiny fraction of power used (20 microwatts/cm2 vs 50-100 watts/cm2). This power saving is enabled by using an event-driven asynchronous design. Moreover, the synaptic connections can be exported and imported, allowing for learned expertise to be shared once learned. The research article primarily focuses on architecture and benchmarks of speed and energy use. The authors additionally provide an example application. “The task had two challenges: (i) to detect people, bicyclists, cars, trucks, and buses that occur sparsely in images while minimizing false detection and (ii) to correctly identify the object. ” Other functions, including “convolutional networks, liquid state machines, restricted Boltzmann machines, hidden Markov models, support vector machines, optical flow, and multimodal classification” were implemented on the chips, though the only details as to efficacy were in a figure showing the process and individual result of the person/bike/car/truck/bus classifier. The programmable synapses are potentially a very powerful tool going forward. The TrueNorth chip has no strict architecture in the way that particular brain regions have, so a chip could be used to emulate a cortical region or a subcortical region, or connections between multiple regions with different specific architectures. Coupling the chip’s features with a new programming language, simulator, integrated programming environment, libraries, packaged applications, and a teaching curriculum, IBM is making experimentation and development with the new chips by labs and firms a high priority. In terms of number of neurons the TrueNorth chip is quite small relative to a mammalian brain, however given that multiple chips can be linked up, the speeds surpass that of a biological brain, the tools to build and experiment, and that this is just the very first production neuromorphic chip, there is every reason to expect even bigger things in the near future.